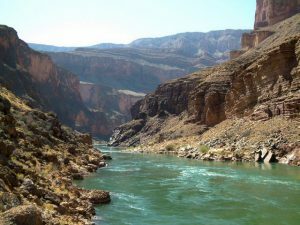 Science and issues affecting the Colorado River will be the focus of events all week long in Flagstaff starting Tuesday, July 24th. The public is invited to attend lectures, films, slideshows, and much more with the kick-off at Heritage Square (114 N. Leroux) starting at 3:30 PM and continuing until 7:30 PM. Free. There will be a Songwriting Contest on the 25th. Perform your best Colorado River song (or general river song) and win prizes! 7:00 PM at Uptown Billiards, 114 N. Leroux. Events continue on Saturday, July 28th, at the Museum of Northern Arizona at noon with more movies and lectures. This begins the 2nd Annual Grand Canyon Authors Symposium: Of Lines and Layers. Authors of some of our favorite books will be on hand: Tom Meyers, Ivo Lucchitta, Bob Audretsch, Scott Thybony, Tom Martin and many more! Hours today will be from 12:00 PM to 5:00 PM. Price is included with regular museum admission. The symposium continues at the museum on Sunday from 1:00 PM to 4:00 PM with more movies and lectures. Price included with regular museum admission.